What would it take to produce 1800 pairs of shoes a day in the late 1800s? Employing around 450 workers to operate leather cutting, stitchers, lasting (or shaping) machines and over 100 sewing machines, Robbins and Kellogg sold its shoes across the country. Established in 1870, the factory used a 40 horse power engine powered by coal. Built in 1870, the shoe company only lasted for 30 years. 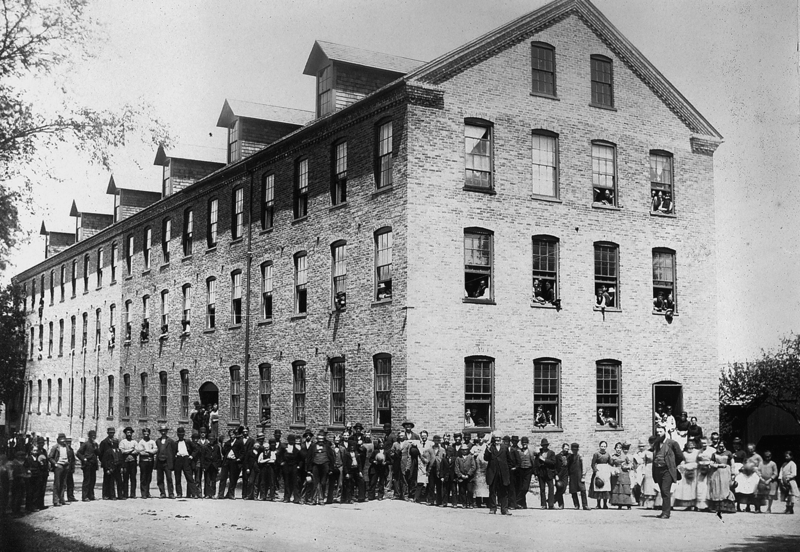 By 1900, Pittsfield’s electrical industry had taken off, and these factories were re-adapted at first for companies producing equipment for General Electric. Later, it became a warehouse for GE and then for England Brothers, Pittsfield’s premier department store located on North Street. Situated in the middle of the city, the factory is surrounded by housing for its workers. A large four story, brick building, dormers protruding from the roof bring light into the attic and give it additional warehouse space. Passing by, check out the cornice designs where the roof meets the brick facades and the fading “Warehouse” lettering on the side of the building.